The festival is provided by the Highland Council and runs over two weeks each October to celebrate the heritage of the Highlands from earliest settlers to modern times, below ground and above. Whether you are a seasoned archaeologist or a complete beginner, the festival will let you explore an amazing range of places and collections. There’s something to suit everyone and many of the events are free! 2018 was the 25th year of the festival, and ran from 29th September to 19th October. There were 123 events and 22 special exhibitions, with a packed conference focussing on Recent Archaeological Discoveries and Research. In 2019 the festival will run from 28th September - 18th October, with the last week including the school holidays. Events will be put up on the website as they are confirmed, beginning in July 2019. The conference will take place on 12th and 13th October at the Council Chamber in Inverness. If you are thinking of contributing an event or exhibition, please get in touch! In the meantime, there is still plenty to explore! The geocache trail is still active. A list of self guided trails is available by clicking here. If your organisation or museum would like to offer an event for HAF, the forms are now available in the Document Library in the 2019 folder. Deadline to submit events is 1 June. Is there a Highland site or object that is special to you? 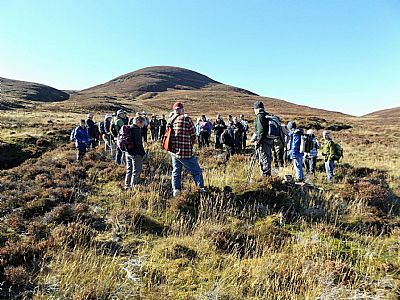 The Highland Historic Environment Record (HER) is the Council’s online database of all known heritage in the Highlands. We’re looking for help to keep it accurate and for photographs of many of the sites and finds included. Can you help? We’re inviting you to adopt an HER record. This may be as simple as just sending us a good photograph. Or you could include descriptions of the present state, forward other out of copyright material which should be included or links to them, add a bibliography or send corrections if needed. Your work will be acknowledged in the record unless you request otherwise.